What do we understand ’noise’ to be ? The term ’noise’ no longer suggests only aesthetic judgement, as in acoustic or visual noise, and is now relevant to domains as varied as communication theory, physics and biology. This trans-disciplinary usage leads to confusion and complication, and reveals that the question of noise is a properly philosophical problem. 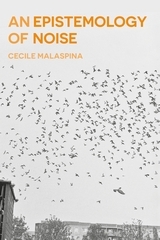 Presenting an analysis of the rising interest in the notion of noise, this book investigates if there can be a coherent understanding of what it is, that can be effectively shared among the natural and human sciences, technology and the arts. Drawing the philosophical consequences of noise for the theory of knowledge, Malaspina undertakes a philosophical revaluation of Shannon and Weaver’s theory of ’information entropy’ ; this forms the basis upon which to challenge the common idea that noise can be reduced to notions of error, disorder or disorganization. The wider consequences of this analysis relate the technological and scientific aspect of noise, with its cultural and psycho-social aspects. At the heart of Malaspina’s argument is the contestation of the ground upon which we judge and distinguish noise from information and finally the exploration of its emancipatory potential.